When Haji Nazeer Ahman Qazi opened his cellphone, he received a text message that would help him manage the ten acres of wheat growing on his farm near Sargodha, Pakistan. The text message—beginning “Dear farmer friend”—stated that 1.3 centimeters (0.5 inches) of rainfall were expected in his area in the upcoming week. Those few words would help him save water and improve his crop yield. Qazi is one of 20,000 farmers who receive weekly text messages from the Pakistan Council of Research in Water Resources (PCRWR). 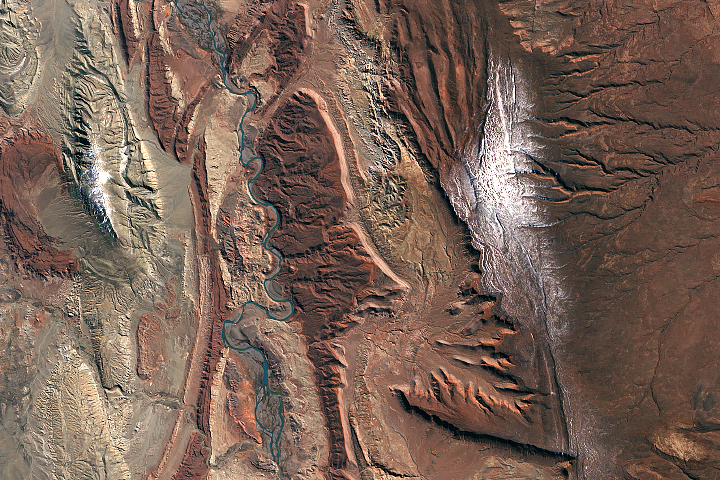 The notifications, partly based on NASA satellite data, provide information on current and future weather conditions, as well as advisories on how to water certain crops. 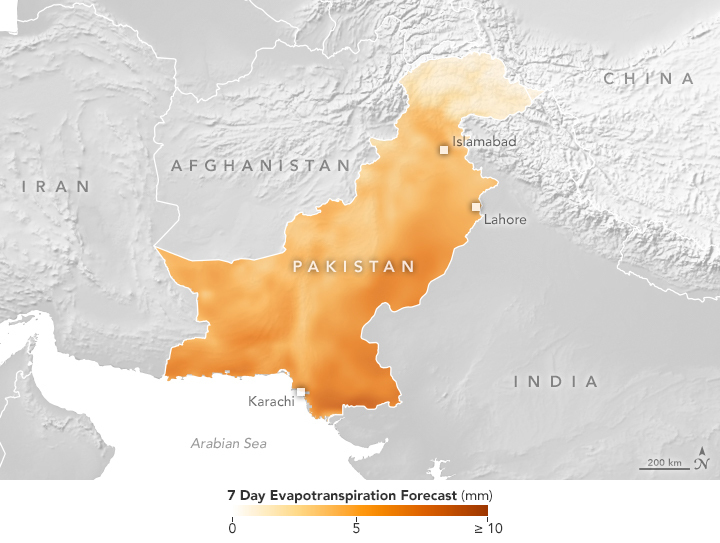 The texts are designed to help prevent a serious problem facing Pakistani farmers: overwatering. Hossain and his colleagues are collaborating with the PCRWR to analyze satellite data, ground-based measurements, and weather models to calculate how much water various crops will need and how much they are likely to get. The PCRWR Irrigation Advisory system, initially funded by NASA’s Applied Science Program, distributes this information via text alerts with simple messages such as: “We would like to inform you that the irrigation need for your banana crop was 2 inches during the past week.” Each simple message is derived from a complex analysis of numerous weather variables. The maps on this page show one of those variables, evapotranspiration, which is an indication of the amount of water vapor being removed by sunlight and wind from the soil and from plant leaves. Hossain’s team uses evapotranspiration to assess the water demand for specific crops. 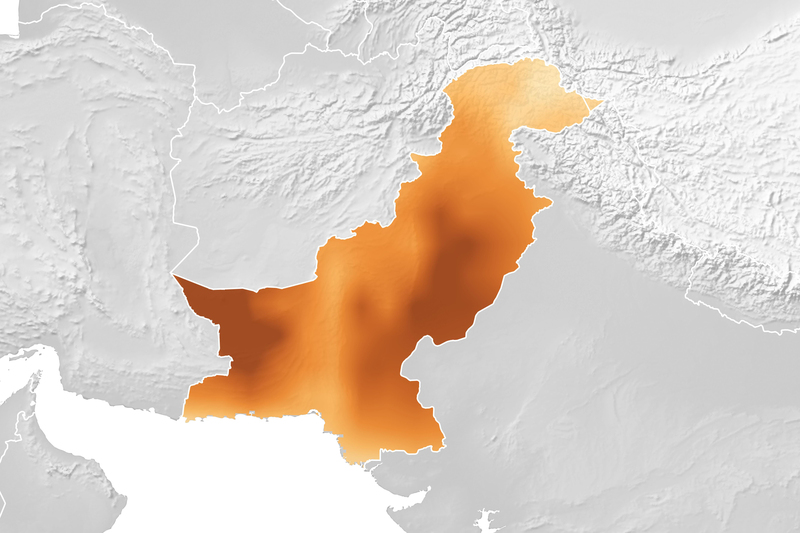 Darker areas indicate places in Pakistan where farmers likely had to pump more groundwater to irrigate their fields. Lighter areas show locations where precipitation was sufficient to cover crop needs. The maps at the top show evapotranspiration from January to September 2018, while this map focuses on August. 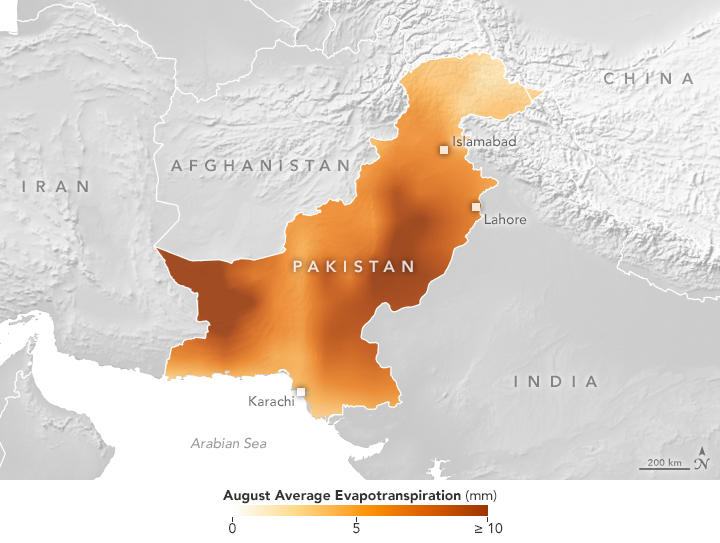 This year, many parts of Pakistan experienced reduced rainfall and drought conditions. Water management is crucial for several reasons. First, applying too much water can actually hinder crop production, sometimes waterlogging the plants and decreasing yields. For instance, rice requires 60 centimeters (24 inches) of water in the Punjab province and 140 centimeters (55 inches) of water in the Sindh province, but farmers often apply as much as 220 centimeters (87 inches). Research shows that the efficiency of water use for crops in Pakistan is lower than the rest of the world. For example, rice growers in Pakistan average 0.45 kilograms of rice per cubic meter of irrigation water, while the world average is 0.71 kg/m3. Second, excess water usage is depleting valuable water resources. Previous generations of farmers used water supplies from rivers, streams, and lakes, but with the country’s growing population and increased farming demand, surface water is no longer enough. 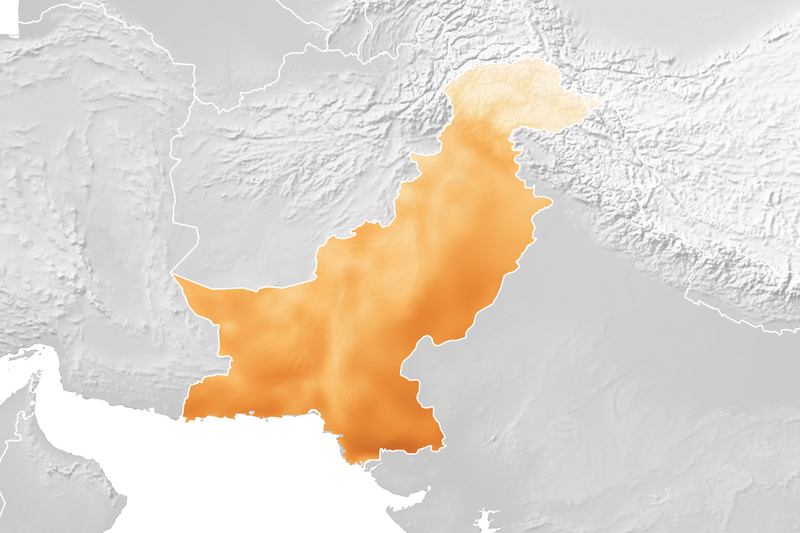 Modern-day Pakistani farmers must pump additional water from underground, which requires costly amounts of fuel to pump. It also depletes groundwater reservoirs, which are important during the country’s dry periods and droughts. The map below shows the forecast for evapotranspiration for October 16-22, 2018. Evapotranspiration is calculated from data on temperature, humidity, wind speed, and solar radiation, as well as a global numerical weather model that assimilates NASA satellite data. The team also looks at maps of precipitation, temperature and wind speed to help determine crop conditions. 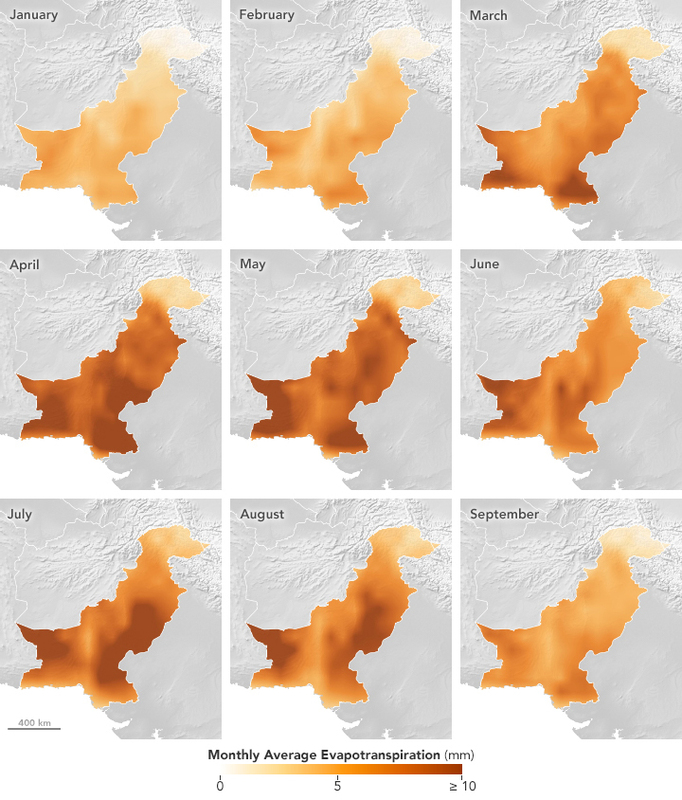 Precipitation data comes from NASA’s Global Precipitation Measurement mission that is combined with ground-based measurements from the Pakistan Meteorological Department. When the supply of water (namely precipitation) exceeds the demand in a specific area as determined by the evapotranspiration data, a text message alert is sent to farmers advising them not to water the plants. When precipitation is below demand, the PCRWR sends a text to farmers with the amount of additional water needed for their crops. “We’re pulling together and calculating how much the crops will need at various growth stages, whether you just planted it, if it’s growing, or ready for harvest,” said Hossain. A survey by the PCRWR found that farmers who used the text message alerts reported a 40 percent savings in water. Anecdotally, many farmers tell Hossain that their income has doubled because they got more crops by applying the correct amount of water. Currently, Hossain and the PCRWR are working with several partners to scale up the advisory service and make it a sustainable business. The Asian Development Bank and a commercial cellular operator have now banded together with University of Washington and PCRWR to make the irrigation advisory an affordable service for at least 100,000 farmers. 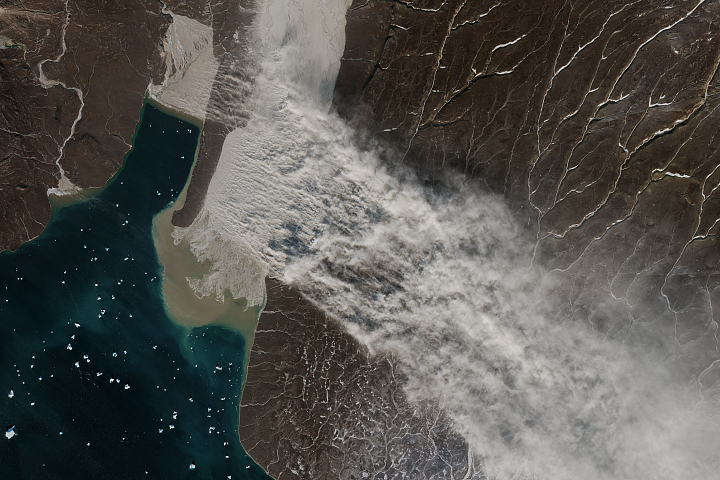 NASA Earth Observatory images by Lauren Dauphin, using data from the South Asian Surface Water Modelling System. Story by Kasha Patel. A project using NASA satellite data helps reduce overwatering and enhances crop yields for Pakistani farmers. Eos (2017, June 21) Growing More with Less Using Cell Phones and Satellite Data. Accessed October 17, 2018. Pakistan Council of Research in Water Resources Irrigation Advisory SMS Service for the Farmers. Accessed October 17, 2018. Pakistan Council of Research in Water Resources (2015) Rice Cultivation on Beds—An Efficient and Viable Irrigation Practice. Accessed October 17, 2018. Pakistan Meteorological Department (2018, June 6) Drought Alert. Accessed October 17, 2018. Sustainability, Satellites, Water, and Environment Research Group. The Third Pole (2017, August 7) Satellites and SMS help Pakistan’s farmers with smart irrigation. Accessed October 17, 2018. Voice of America (2017, June 26) Pakistani Farmers Get Tips via Text. Accessed October 17, 2018.